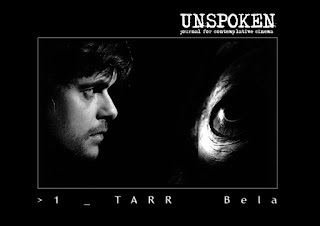 The first and only issue of the UNSPOKEN Journal (EDIT 2010: moved here; EDIT 2011: now offline) is finally completed, you can read it online, and print it out at the website. Thanks a lot to our guest editor Yvette Biró who directed this special issue dedicated to Tarr Béla, and to all our contributors who kindly replied to our request : Robert Davis, Matthew Flanagan, Edward Howard, Ian Johnston, András Bálint Kovács, Pacze Moj, who developed their interpretation of what is Contemplative Cinema in Tarr's films. And our apologize for the submissions that couldn't make the final line up for various complicated reasons.